Our annual Button Trunk Show is this Saturday, April 29! Once again Linda Sicard will be filling our classroom with her ever-growing collection of antique, vintage and contemporary buttons of every description. You'll find the perfect buttons to complement all your projects! There will be shell, glass, brass, resin, pottery, pewter, Bakelite, celluloid, vegetable ivory, Goodyear and even buttons made from 5 million year old fossilized clam shells! Linda will also be offering a selection of her unique UnButtons Antique Button Jewelry for sale -- one-of-a-kind earrings, bracelets and pendants she creates from intricately detailed buttons from the last century. Cash, check or credit card cheerfully accepted! Machine Quilting with Your Walking Foot. Can't quite get the hang of free motion quilting? 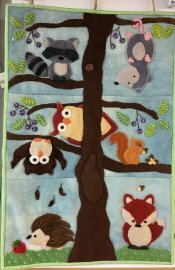 Come join Beth as she shows you how to quilt with your walking foot. 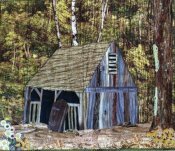 You will learn some basics of the walking foot, then move on to do some matchstick and crosshatch quilting. 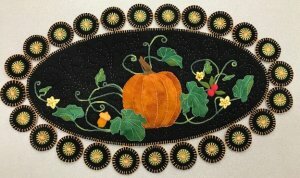 We will explore using some of your decorative stitches along with quilting some curves, circles, and radiating designs. Beth will demonstrate which templates you can use to make life easier. 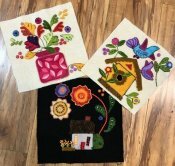 So come join the fun and start quilting those tops! May 4, 1:00 -4:00 p.m. and May 5, 10:00 a.m. - 1:00 p.m. Beth Kondoleon. $40 for both sessions. 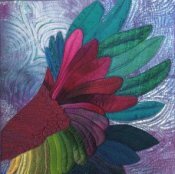 We've received lots of gorgeous batiks from Anthology, Hoffman, and RJR. We also have a new flannel line, "Welcome Home", with a vintage floral look, and several bolts of "Blueberry Park", a new line from Robert Kaufman in soft greys and taupes with wonderful textural designs. And, of course, we continually add to our color wall. We hope to see you soon browsing through these and other new beautiful fabrics.